MONSTER SIZE 270 lb. Blacksmith Post Vice! This vise is so big it can hold an 80 lb. anvil in its jaws with no problem. It's the heaviest post vise I've ever seen. On top of being HUGE, the vise is in Excellent condition. The screw threads look like new and the heavy duty spring is STRONG. The mounting plate is extra BIG and tightens up tight. The handle isn't perfectly straight. Distinctive to this vice is the extra heavy and beautifully hand forged bench plate and the gracefully curved leaf shaped spring. 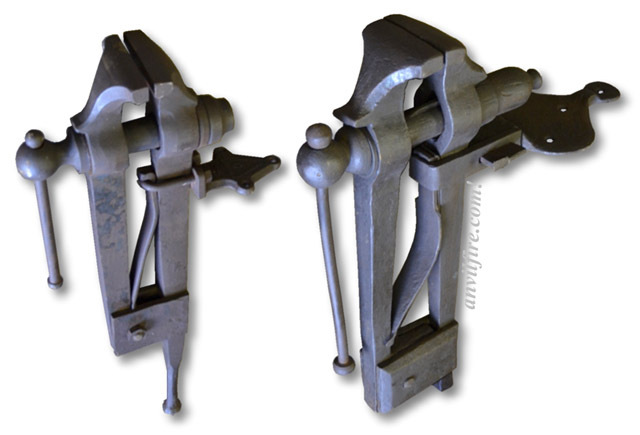 Compare those to the cast bench plate and the plain bent spring on the Columbian vise. THE SIZE: When Steve commented that this was the largest post (Blacksmiths) vice he had ever seen he did not know how close he was to the definitive size. According to our math (see article to come), these vices start at 30 pounds and are almost directly scaled up in every dimension as they are made larger. The major exception is the height (to fit humans) and thus the length of the leg is shorter as the vise is made larger. 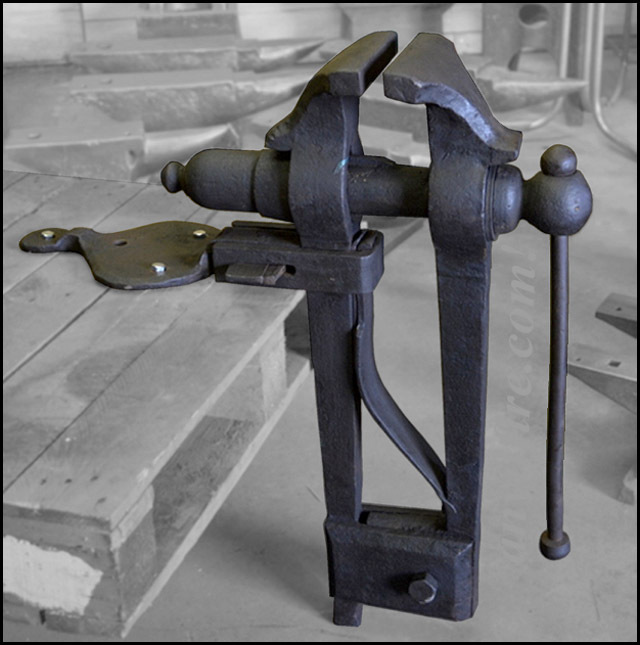 A vise double the dimensional size of a 30 pound vise is 8 times the volume (Wt * 2³), thus 240 pounds. At this size the cheek plates and pivot are a comfortable 4 inches off the ground. On this vise at 270 pounds the leg is only 1-1/2" or so. This is just long enough to keep the cheek plate and pivots out of the dirt IF on a hard surface AND IF the shop is kept clean. Clearance under the cheek plates is also needed to leg the jaw to move. 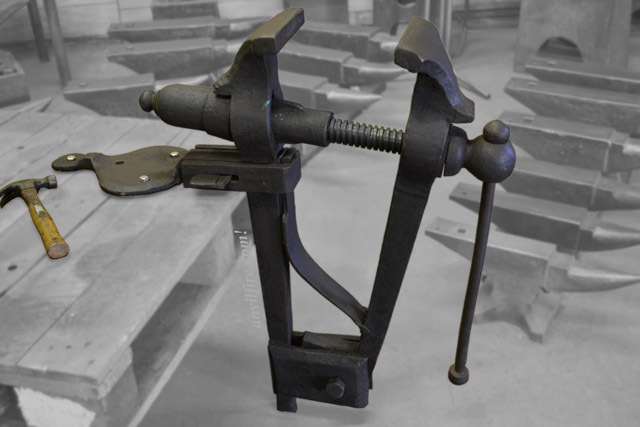 THUS this is the largest traditional English leg vise that could be made. Of course the dimensions can be fiddled with, the jaws made wider, the frame thicker and run the weight up. But somewhere in forgotten history a British Blacksmith with a degree of mathematical skills defined the tables that were followed forever to become a both a tradition and global standard. Such were the oportunities and genius of the Industrial Revolution.